30 ml liquid refill for use with the Zig Zag electric dispenser. 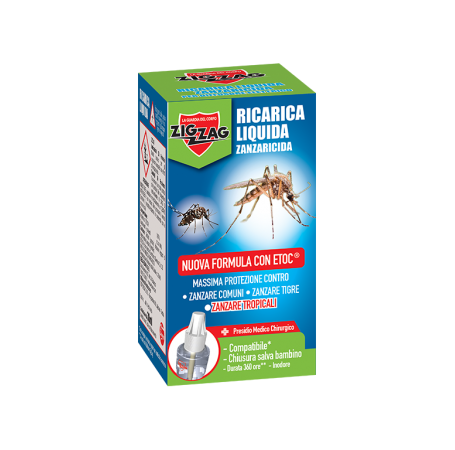 Insecticide effectiveness against mosquitoes, tiger mosquitoes and harmful and annoying flying insects in businesses and homes. Does not emit fumes or leave ash and emanates an attractive perfume. Notes: Tested positively against Tiger Mosquitoes. It emanates an attractive perfume in the room. Screw the Zig Zag Mosquito container into the special electric dispenser and connect it to the 230V then switch on with the button on to the device, press it again once you have decided to turn off it. Used for 8 hours per day, a bottle will be usable for at least 45 days before running out. Ventilate the room during use. Refillable COMPATIBLE with most of the Electro-Emanator on the market.